Touching upon every conceivable point on the spectrum of a seasoned palate, the summer time mixes menu at Delhi Baking Company (DBC) in JW Marriott, Aerocity, is an exercise in tasteful invention. The spread is a veritable riot of colours; the fruit-inspired desserts range from mango to lemon and strawberries and even incorporate desi-themed Gelato. You can't take the French out of a patisserie, and its elegant touch continues to linger, but DBC's new avatar is more experimental and fresh. Delighting patrons from June 1, the reworked menu by executive pastry chef Narendra Lendave is a clever fusion of classic and contemporary flavours. The creator of the exquisite recipes, Lendave says that he has experimented with flavours ranging from macha (green tea) powder to Bailey's cream while retaining the science of texture and consistency. And, there is no sinful chocolate or cloying layers of icing sugar getting in the way of sheer confectionary elegance. From the paper thin layers of the opera slice to the flaky crust of the coffee religieuse and the coconut compote of the pineapple mousse, discerning dessert lovers can pander to every whim at DBC. 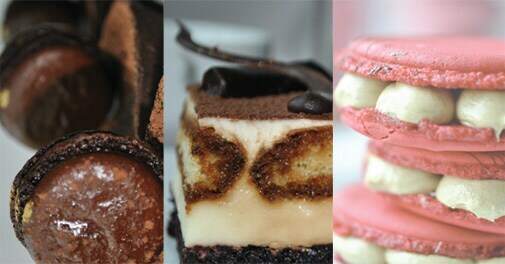 The gelato comes in delicious renditions of quirky flavours paan kulfi, masala chai and salted caramel to name a few. The salted caramel is a creamy profusion of intermingled strains of sweet and savoury. The masala chai gelato is gorgeous, the robust flavours of the well-loved tea preparation create an underlying balance that offsets the subtle sweetness of the ice cream. Chef Lendave outlines the elaborate process of making the masala chai gelato. As the milk cream boils, spices are gradually added to it, releasing a strong aroma. The steeping and boiling process lasts through the night and it is only the next morning that the tea is strained and its essence infused into the ice cream. 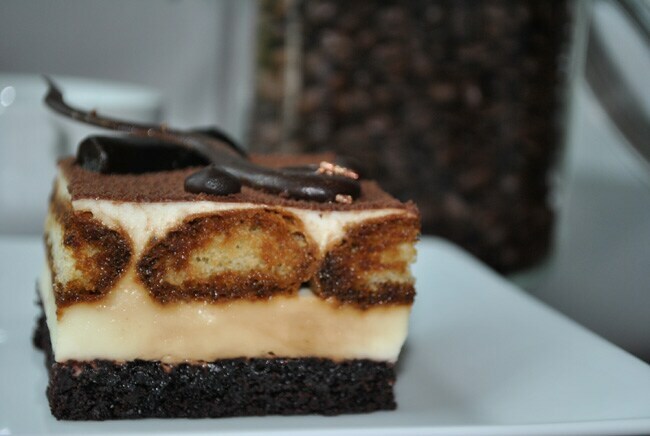 Now, I am not a big fan of tiramisu but DBC's version really tempts you to 'pick it up'. The light dessert has a surprisingly dense flavour of dark chocolate balanced with the bitter hint of coffee. Traditionally served in a glass, this version of tiramisu is a sturdier version propped up on a base of sinful coffee sponge. The strawberry basil bombe is a semi-circular mould of pink goodness on a base of almond sponge dacquoise. Light and creamy with a dash of strawberry jelly, the mousse with a texture between cake and ice cream has a subtle sweetness punctuated with the freshness of basil. Pop hues of lime green sandwiched within discs of carmine pink, the raspberry pistachio macaroon is a towering burst of colour and textures. 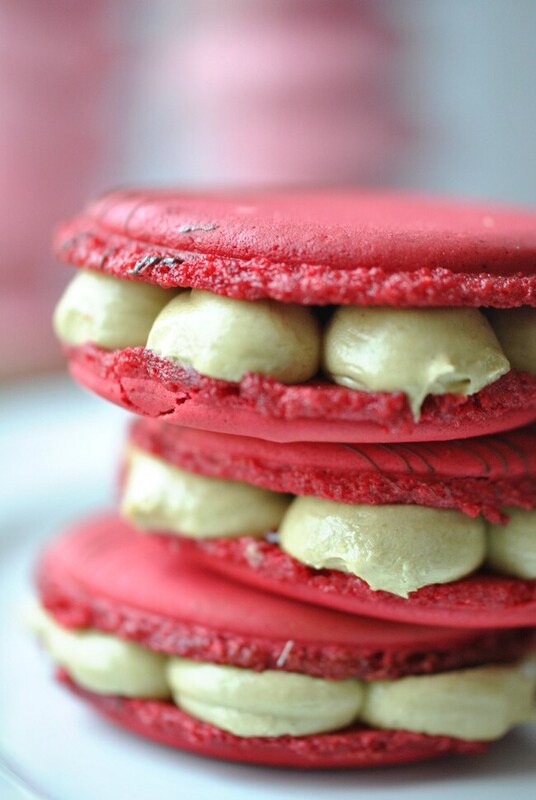 The chewy discs made of raspberry essence are offset by the nutty flavour of the pistachio mousseline. Cafes are gradually giving in to the macaroon trend, but the technique involved in making the perfect macaroon remains a preserve of experts. Close attention needs to be given to the consistency at which the batter is piped and baked, Chef Lendave says. The chocolate salted caramel tart is a mature dessert that demonstrates degrees of finesse. Marked by an intensity of flavours, the tart is a dense rendition of chocolate-y decadence tempered by strains of salted caramel. I'm convinced dark chocolate and salted caramel is a match made in heaven. Topped with a chocolate macaroon, it's a perfect after-dinner treat. The adventurous can refer to the recipe from chef Lendave given below. The next time you visit DBC, you might just find an interactive chocolate studio, another vision of Chef Lendave. Nothing's confirmed yet, but we're happy to wait. Right now, it's a range of delectable truffles and designer chocolate on display lemon rose, pistachio truffle and rosemary cointreau. Cream the butter with powdered sugar. Add the eggs, yolks, vanilla extract, flour and cocoa powder and blend until well combined. Next roll out and press the dough into ring molds - 3" x 0.75". Blind bake the shells using parchment paper and beans for about 15 minutes at 162»c. Reserve. Combine the sugar, cream of tartar and 45 ml water in a small pot set over high heat. Cook the sugar, swirling it in the pan, until it becomes a deep amber colour. Remove from heat and add the salt and butter and mix until melted and well combined. Whisk in the heavy cream and continue to cook, stirring constantly for 30 seconds. Remove from heat and allow cooling at room temperature. Reserve. In a medium size pot over medium heat warm the milk, heavy cream and trimoline. Temper the eggs into the cream and pour over chocolate in order to melt, mix and strain. On the precooked tart shells, spread a thin layer of caramel. Allow the caramel to set and pour the ganache filling all the way up the tart shell wall and bake at 135»c for 20 minutes or until set in the middle. Melt chocolate with cream in the top of a double boiler, stirring until smooth. If you don't have a double boiler, use a metal bowl set over a pot of barely simmering water. The bottom of the bowl should not touch the water. When the chocolate is melted into the cream, remove bowl from heat. Add the butter, stirring until butter is melted. Let stand at room temperature until cooled completely and slightly thickened. 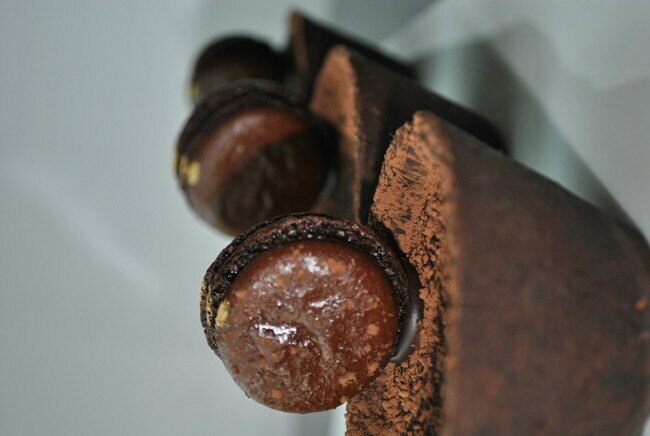 Serve tart at room temperature with dust of cocoa powder & garnish the top with chocolate macaroon, gold leaf and sea salt. 1. Preheat the oven to 355»F (180»C). Line two baking trays with parchment paper. 2. If using whole almonds, pulse in a food processor until very finely ground, 2 to 3 minutes. 3. Add the confectioner's sugar and process to a fine powder. Sift to remove any lumps. 4. Beat the egg whites in bowl with an electric mixer at medium speed, adding the food colouring as you go until you reach the desired shade. Then increase speed to high and continue to beat until the whites just hold stiff, glossy peaks. 6. With a wooden spoon, mix from the centre of the bowl outwards, turning the bowl as you go. You want to achieve a smooth, lightly coloured mixture. 7. Spoon batter into a piping bag with a 1/4-inch round tip. If you don't have a piping bag, use a plastic freezer bag, pressing out excess air. Snip off one corner to create a 1/4-inch opening. Pipe inch-wide macaroons onto the baking trays, about 1-1/2 inches apart. You should have peaked mounds of batter, about the size of a chocolate kiss. 8. Cook for eight to nine minutes, leaving the door of the oven slightly ajar. 9. Remove the macaroons from the oven. Pour a little water between the baking tray and the parchment paper; this makes the macaroons easier to lift off when they have cooled. Cool completely on racks, about 30 minutes. Sandwich a thin layer of fillings between two macaroons. The two bottoms face the filling. 11. If you can, leave the finished macaroons in the refrigerator for 24 hours. This allows the flavours and texture to develop and intensify.